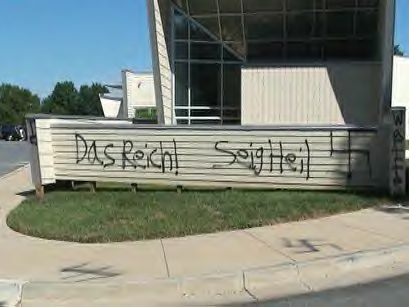 Olney, MD - Vandals struck a Montgomery County synagogue, spray painting Swastikas and anti-Semitic slogans on the outside walls, parking lot and light posts, according to police and a synagogue member. Debbie Kovalsky, synagogue president, said the damage is “heart wrenching to see.” “The fact that someone out there is knowledgeable about this kind of hate, this is more upsetting than some teenager with spray-paint,” Kovalsky said. Kovalsky said the congregation, which has about 430 families, planned to begin clean-up Monday and to hold a special service. is this a frum place? i know that there's a rov there that really brought yiddishkeit to the area with a shul and kollel etc. i think his name is molovsky. his rosh kolel is a son in law of lakewood mashgiach. Why do we continue to refer to these acts of hatred as "Vandalism"....vandalism is the physical damage caused. The true damages are the words and mental images that these acts portray. Let's call it what it is "acts to incite hatred"
Every single Shul should be equipped with multiple high quality security cameras and spot lights. B'nai Sholom of Olney is Conservative. Rabbi Shaya Milikowsky is the Rov of Ohev Sholom Talmud Torah Congregation of Olney, which is frum, and a member shul of the Va'ad Harabonim of Greater Washington. When the JDL became active in NYC in 1969, it used to send groups of members to wait in hiding for these thugs, who were intent on vandalizing and damaging Synagogues. When the JDL caught the thugs who would harm our places of worship, they were not turned over to the police; rather, instant justice was rendered (i.e. beating the heck out of the low life trash). They received a lesson in Jewish power which they did not forget! It is too bad that the JDL is no longer active. If it was active, the 1991 pogrom in Crown Heights, would never have been allowed to proliferate. Precisely. To the anti-Semitic animals we're all the same. They want to put us all in the same place. I'm with you on the usefulness and dedication of the JDL, who acted out of pure Ahavas Yisroel. They sent a powerful message where it had to be sent. But I disagree with your assessment that their presence would have prevented the riots in Crown Heights. The atmosphere was saturated with hate for all non-blacks. And the fool that occupied City Hall at the time was not only ineffective in preventing the riot. He made the situation worse. And his so-called police commissioner, lee --out of town-- brown openly cursed out Jews on the radio. Milikovsky was a rove in Olney. DOnt know if still there. My point was that had the JDL been there in force, they could have protected the residents from the mob, which continued on the rampage for three days and nights.